When I was a student, back in the early 1980s, I used to wear an army jacket that I bought in a flea-market in Bandung, with a red and white pin of the Indonesian flag attached on it. I also put the flag on the wall of my boarding house, with an Indonesian map adjacent to it. Whenever I sang or heard Indonesia Raya, the national anthem, quite often my eyes became wet and my heart beat faster, especially when it reached the phrase of "bangunlah jiwanya, bangunlah badannya, untuk Indonesia Raya" (wake the soul up, wake the body up, for the Great Indonesia). I also used to sing Leo Kristi's songs and played them with my guitar, such as the song of Nyanyian Tanah Merdeka, Anna Rebana, Lewat Kiara Condong, Nyanyian Malam, etc. I felt the spirit, the soul, the pride, as an Indonesian. But those days are gone now. I have no green army jacket, no pin, no flag, no map, no heart-pounding songs. I rarely hear the Indonesia Raya, but even if I sing probably there will be no soul anymore. There were two occasions lately, however, that brought those memories back alive. Last week I had a team building session where we went to Brigade 3234 at Gunung Putri, Bogor, to play paintball game. 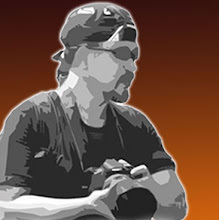 It pumped my adrenalin faster, and it gave me a little sense of how it could be in war situation where the line between life and death is very thin. The other occasion was yesterday, when we went to Kelapa Gading Mall to watch Nagabonar-2 movie, starring Deddy Mizwar (the original Nagabonar) and Tora Sudiro as Bonaga, the son. It was not only quite entertaining, but also inspiring. It brought back the lost idea of nationalism and patriotism, even though Bonaga stance towards Japanese investment at the end of the story is debatable. Still, it's a must see movie. Those two above things that brought the memory of those years back when the red and white flag was still displayed proudly on my jacket. So, what happened with this life? Why there are only few people have ever visited Soekarno-Hatta Monument? 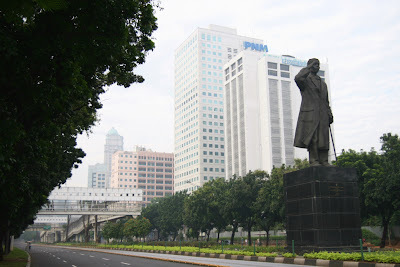 Why nobody has ever saluted the Great General Sudirman, or pay respect when they pass the statue? When was the last time we visited the heroes cemetery? Anybody has the red and white flag displayed proudly at home? Anybody knows the answer? Anybody wants to share what patriotism means today? Soekarno was a great speaker, very famous in hypnotizing people with his nationalistic speech. Most of people stopped working to listen of what he said through radios across the country. Hatta was the first vice president, and the most respected people after Soekarno, because of his strong stance towards democracy and economy. I took the picture of the Great General Soedirman this early Sunday morning, when the street was closed for motorists to allow people to use it for street sports activities. He fought against Dutch occupation with only one lung functioning.